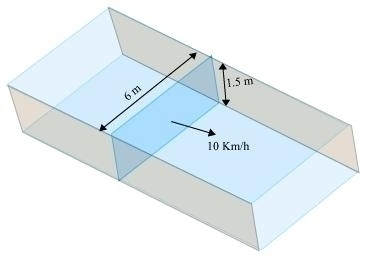 NCERT Solutions for Class 10 Math Chapter 13 Surface Areas And Volumes are provided here with simple step-by-step explanations. These solutions for Surface Areas And Volumes are extremely popular among class 10 students for Math Surface Areas And Volumes Solutions come handy for quickly completing your homework and preparing for exams. 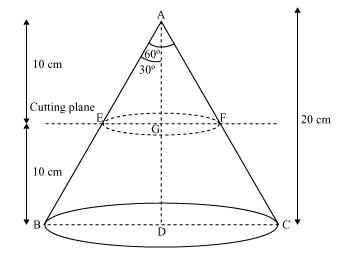 All questions and answers from the NCERT Book of class 10 Math Chapter 13 are provided here for you for free. You will also love the ad-free experience on Meritnation’s NCERT Solutions. All NCERT Solutions for class 10 Math are prepared by experts and are 100% accurate. 2 cubes each of volume 64 cm3 are joined end to end. Find the surface area of the resulting cuboids. 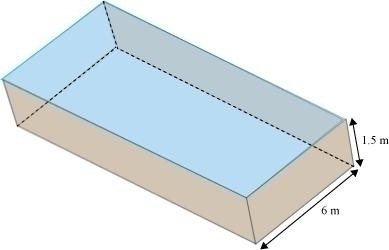 If cubes are joined end to end, the dimensions of the resulting cuboid will be 4 cm, 4 cm, 8 cm. From the figure, it can be observed that the greatest diameter possible for such hemisphere is equal to the cube’s edge, i.e., 7cm. Therefore, it will cost Rs 22000 for making such a tent. 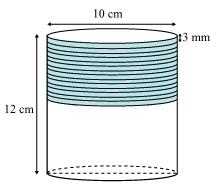 The total surface area of the remaining solid to the nearest cm2 is 18 cm2. Let n number of lead shots were dropped in the vessel. Hence, the number of lead shots dropped in the vessel is 100. The object formed by recasting the hemisphere will be the same in volume. Hence, the height of the cylinder so formed will be 2.74 cm. Let the radius of the resulting sphere be r.
The object formed by recasting these spheres will be same in volume as the sum of the volumes of these spheres. 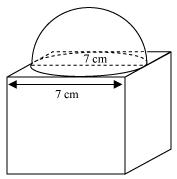 Therefore, the radius of the sphere so formed will be 12 cm. 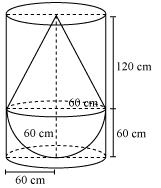 The shape of the well will be cylindrical. Volume of soil dug from the well will be equal to the volume of soil scattered on the platform. 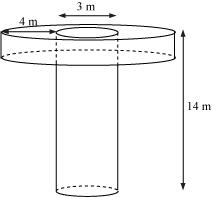 Therefore, the height of such platform will be 2.5 m.
From the figure, it can be observed that our embankment will be in a cylindrical shape having outer radius (r2) as and inner radius (r1) as . Let the height of embankment be h2. Therefore, the height of the embankment will be 1.125 m.
Let n ice-cream cones be filled with ice-cream of the container. Therefore, 10 ice-cream cones can be filled with the ice-cream in the container. Coins are cylindrical in shape. Let n coins be melted to form the required cuboids. Therefore, the number of coins melted to form such a cuboid is 400. 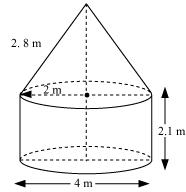 Let the radius of the circular end of conical heap be r2. 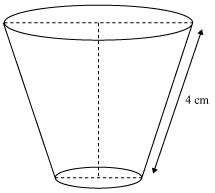 The volume of sand in the cylindrical bucket will be equal to the volume of sand in the conical heap. 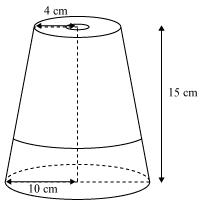 Therefore, the radius and slant height of the conical heap are 36 cm and respectively. Consider an area of cross-section of canal as ABCD. Let the irrigated area be A. Volume of water irrigating the required area will be equal to the volume of water that flowed in 30 minutes from the canal. Therefore, area irrigated in 30 minutes is 562500 m2. Consider an area of cross-section of pipe as shown in the figure. Let the tank be filled completely in t minutes. Volume of water filled in tank in t minutes is equal to the volume of water flowed in t minutes from the pipe. Therefore, the cylindrical tank will be filled in 100 minutes. Therefore, the capacity of the glass is . 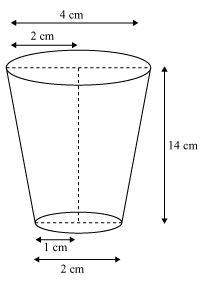 Therefore, the curved surface area of the frustum is 48 cm2. Therefore, the area of material used for making it is . Rs 209 and the cost of metal sheet used to make the container is Rs 156.75. Let the length of wire be l.
It can be observed that 1 round of wire will cover 3 mm height of cylinder. 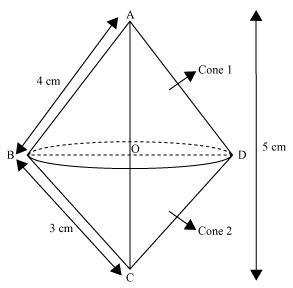 The double cone so formed by revolving this right-angled triangle ABC about its hypotenuse is shown in the figure. 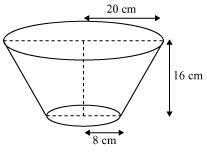 A cistern, internally measuring 150 cm × 120 cm × 110 cm, has 129600 cm3 of water in it. Porous bricks are placed in the water until the cistern is full to the brim. Each brick absorbs one-seventeenth of its own volume of water. How many bricks can be put in without overflowing the water, each brick being 22.5 cm × 7.5 cm × 6.5 cm? Let n numbers of porous bricks were placed in the cistern. Therefore, 1792 bricks were placed in the cistern. In one fortnight of a given month, there was a rainfall of 10 cm in a river valley. If the area of the valley is 7280 km2, show that the total rainfall was approximately equivalent to the addition to the normal water of three rivers each 1072 km long, 75 m wide and 3 m deep. Thus, the total rainfall is approximately same as the volume of the three rivers. Let ABC be a cone. A frustum DECB is cut by a plane parallel to its base. 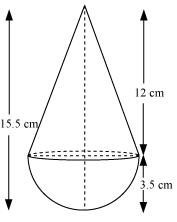 Let r1 and r2 be the radii of the ends of the frustum of the cone and h be the height of the frustum of the cone. Let ABC be a cone. A frustum DECB is cut by a plane parallel to its base. 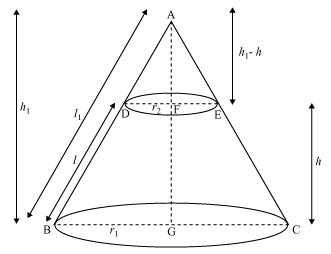 Let r1 and r2 be the radii of the ends of the frustum of the cone and h be the height of the frustum of the cone.